Ever since Lafayette Proulx quit his day job, left his wife, hauled his dog and his Royal portable across town to Judi Dubey’s house, and set out at last to be a fiction writer, his life has been a sordid mess. Judi’s exotically dysfunctional family isn’t all to blame. Sure, the murders are disconcerting. And, yes, Judi’s father’s gone off the deep end. Worse are the vicious rejection letters Laf gets from editors. To top it off, Laf’s falling for Judi at the same time he’s nettled with guilt, is in marriage counseling with his wife, and is writing his long-hoped-for novel. When Judi is diagnosed with stage IV cancer, they both struggle to find the memory that will comfort, the truth that will redeem in a world where everyone suffers some kind of love disorder. John Dufresne, called “a highly readable Faulkner,” will once again take the literary world by storm with this new tragicomic tale. “Rarely have I laughed so often while reading a book or, coming to the end, cried so hard. 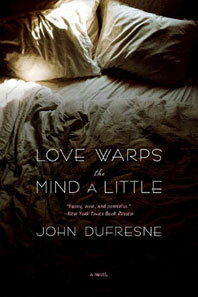 Love Warps the Mind a Little is a masterpiece of the genre that writers call the 'funny-sad novel,' where humor both defies and gives shape to grief. It is rich entertainment, sheer lunacy, moonshine for the wounded heart.” — Julia Glass, author of I See You Everywhere, NPR's All Things Considered.